ABU DHABI, Aug 31 2017 (IPS) - Since weather affects everyone, the idea that women are more susceptible to the effects of climate change may strike some as puzzling. However, according to a United Nations report, State of the World Population, women—particularly those in poor countries—will be affected differently than men. An Environmental Justice Foundation report revealed that by 2050 the number of people fleeing the impacts of climate change could reach 150 million. And, according to the Women’s Environmental Network, 80 per cent of these climate refugees will be women and children. This is primarily because women make up the majority of the world’s poor, tend to have lower incomes, and are more likely to be economically dependent than men – all of which greatly limits their ability to cope with difficult climate conditions. In addition, while extreme weather and disappearing water resources affect entire communities, women in rural areas represent 45-80 per cent of the agricultural workforce and are more likely to feel the brunt. This means that not only are women more vulnerable to the effects of climate change, they also have fewer opportunities to make decisions on how to deal with it – men have greater access to the money and education necessary to participate in climate-change decisions, policymaking, and local planning. However, despite being often underrepresented in drafting policy and strategies to tackle the causes and impacts of climate change, many women from rural areas around the world are now actively taking the responsibility to protect the environment, their families, and livelihoods. 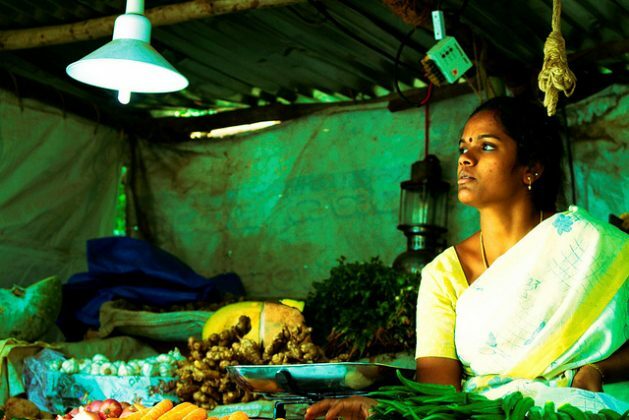 In growing recognition of the connection between women’s rights and climate change, Greenpeace has been working on multiple solar energy projects that assist women at community levels to implement simple, effective, and affordable sustainable solutions in rural areas in developing countries. “We believe women are the most affected by climate change and, when empowered, can be positive agents of change in the path towards a sustainable world powered by 100 per cent renewable energy,” says Ghalia Fayad, the Arab World programme leader for Greenpeace Mediterranean. The NGO has supported adapting solar systems to replace the more costly previously used diesel generators that also suffered from chronic electricity shortages in several primarily women-run cooperates that are now diversifying the production of the likes of argon, almond, and eggs in the country. Greenpeace is also currently running solar cooking training sessions that showcase the potential of solar energy as an alternative to coal, wood, and butane gas to women in rural Morocco. “The women who are the voice of this campaign ask for the Moroccan government to act on the legislative and institutional framework that would then enable the spread of renewable energy on decentralized level,” adds Fayad. Earlier this year, the NGO also collaborated with Deir Kanoun Ras el Ain, a 23 women strong cooperative in South Lebanon that produces artisan food to launch a crowdfunding project to install solar power to heat water and power machines. The cooperative now has 12 solar photovoltaic (PV) panels, with a total peak production capacity of 3 kilowatts. Coupled with energy efficiency measures including LED lights, thermal insulation and a solar water heating system, the annual electricity bill could be cut by two thirds and reliance on their diesel generator reduced to a minimum. “Women generally are often most connected to their communities and family, which gives them a unique potential to contribute to create real and lasting change,” says Fayad. Their perspectives are essential to ensuring local people have a say in the changes affecting their lives, she adds.